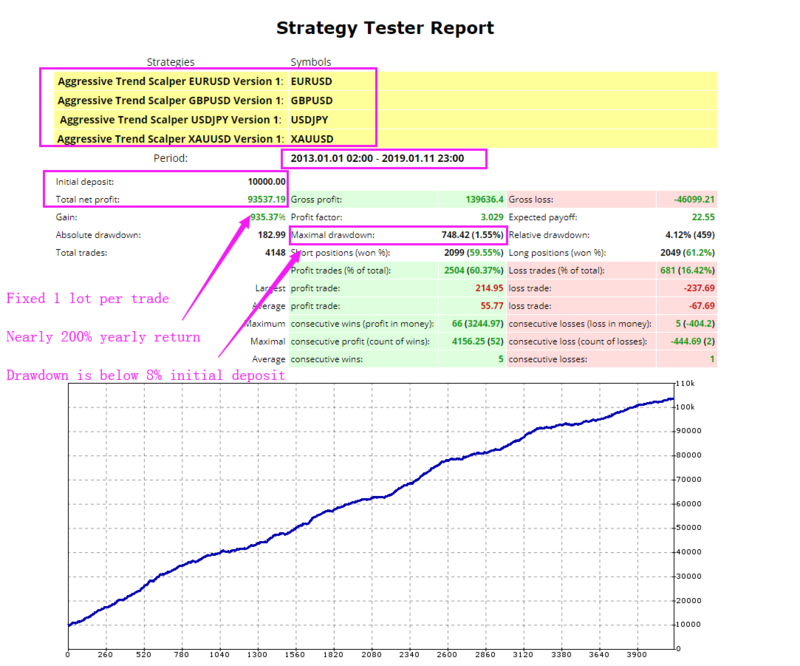 Profit Factor, Expected payoff, Maximal drawdown and Winning rate of Aggressive Trend Scalper. Why Backtesting of Aggressive Trend Scalper is necessary? Backtesting is the process of testing a Forex strategy with historical data in order to fully assess its potential risk and profitability. A well-conducted backtest that yields positive results assures traders that the strategy is fundamentally sound and is likely to yield profits when implemented in reality. A well-conducted backtest that yields suboptimal results will prompt traders to alter or reject the strategy. Particularly complicated trading strategies, such as strategies implemented inside Aggressive Trend Scalper, rely heavily on backtesting to prove their worth. Backtesting assists with determining how profitable a particular strategy would have been if running on past data, giving an indication of how profitable it can be on future data and providing a measure of the confidence required when it comes to running the strategy on a live account. It is extremely hard to determine the potential performance of a strategy by running it in a "forward testing" mode on live data. Typically, the data obtained in such tests is nowhere near enough to have a sufficient statistical weight unless the testing period is very large. Additionally during "forward testing" period, put at risk real money. We don't want to play with yours money! Here backtesting comes in. It provides the opportunity to run the strategy in a virtual environment on historical data. In most cases the results are enough for a proper evaluation of the strategy's merits. The purpose of the tests is to show you the differences from scam systems which promise 100% daily profits. To show the real values of Profit Factor, Expected payoff, Maximal drawdown and Winning rate. You'll understand what you can expect and what to don't expect from this expert advisor. Maximal drawdown is below 8% of initial deposit. Total winning rate is above 60%. Expected payoff is nearly 200% yearly return. We believe this is a very safe and profitable system. Slippage and sudden spread spike - higher spread always happens when some data release, as NFP, FOMC, ECB... In this case, the market always in high volatility. Theoretically it will not affect much to the result. However, we recommended to stop the EA running during some Key risk events. Let's say Brexit vote or something like that. Usage of inappropriate broker - Costs of trading vary from broker to broker. For example if you have 1000 trades per year with the brokers A and B and the both have the same spread and commissions, but the average slippage is 3 points per trade in broker A and average slippage is 6 points per trade in broker B, you'll have to pay additional 300 pips to broker B. The total trading costs of Broker B are significantly increased! So we consider that the broker B is not suitable for the system. Read the article "How to test the broker levels of slippage". Internet connection interruptions - the reasons for that bad event can be many. From trivial personal things, as zones without good coverage of your wifi router. Pass through the problems caused by the internet provider. And get to government regulations. Unexpected closing of your MetaTrader - Crashes of your PC due to lack of electricity power. Reboots of Operation System (OS), without your knowledge, due to Windows Update or installation of new software. Other reasons which require stop of the computer. For example you are going on holiday or need to go on a business trip or etc. Due to above situations is impossible to placed the Aggressive Trend Scalper on a home computer around the clock without downtime! The standard computer cannot guarantee stable environment for achieving results as into this backtest. The best results are possible only using the recommended setup! Forward test results of Aggressive Trend Scalper.